A new sign went up in Florence on Via dello Studio two weeks ago. It messes up one of the the best photo vantage spots for shots of the Duomo. It points at the cathedral. It informs tourists that toilet facilities were in that direction. 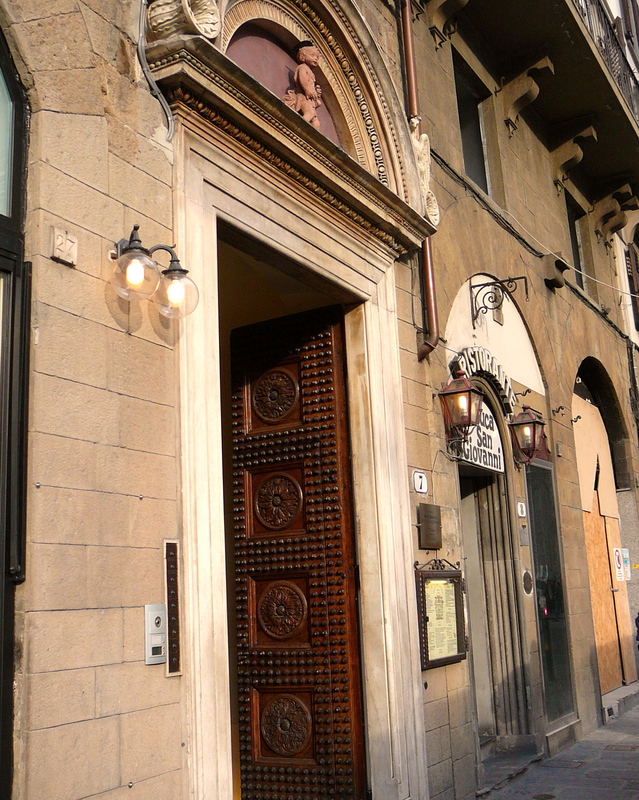 With 5 million visitors each year – mostly day trekkers – wandering the cobblestones of Florence, such facilities are necessary, to say the least. And they are rare. And hard to find. So a sign is good. Toilets are good. Any tourist, who has been thrown out of the Savoy Hotel because a requirement for using the public restroom is that one has a room in the hotel (thus negating the need for the public toilet), knows that really public loos are good. The sign went up because new facilities just opened on the edge of Piazza San Giovanni, across the street from the Baptistry. For a mere 80 cents there are seats for those who can find the door. 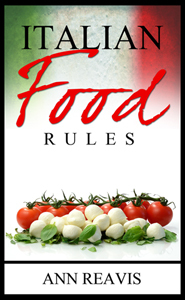 Which brings us back to the sign on Via dello Studio. 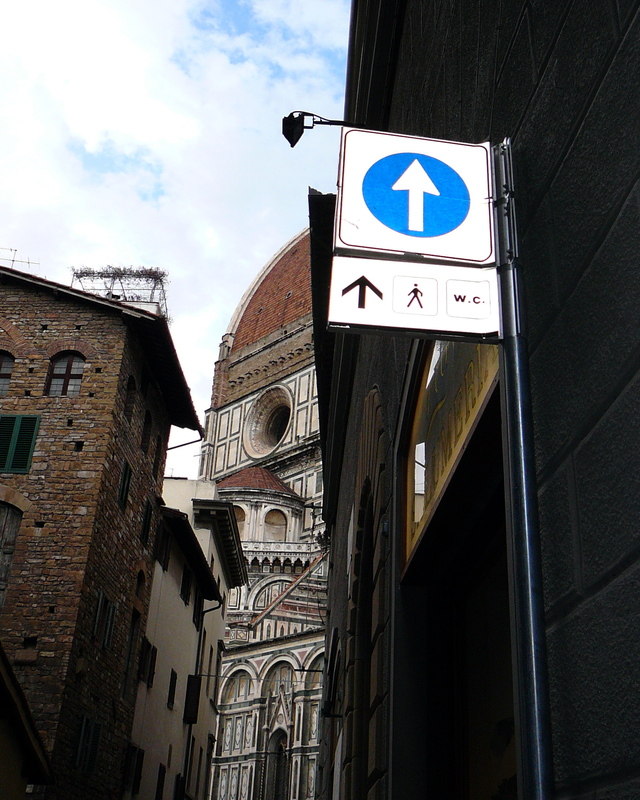 About 100 feet past the sign, the street ends at the cathedral. There the observant will look to the left and up and find another new directional WC indicator. 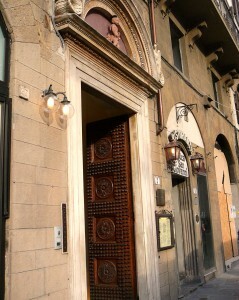 To Giotto’s Bell Tower. Following along the side of the cathedral, the desperate will look in vain for the next sign. One theory some hold is that in Italy there will always be a sign until that moment when you actually need one. 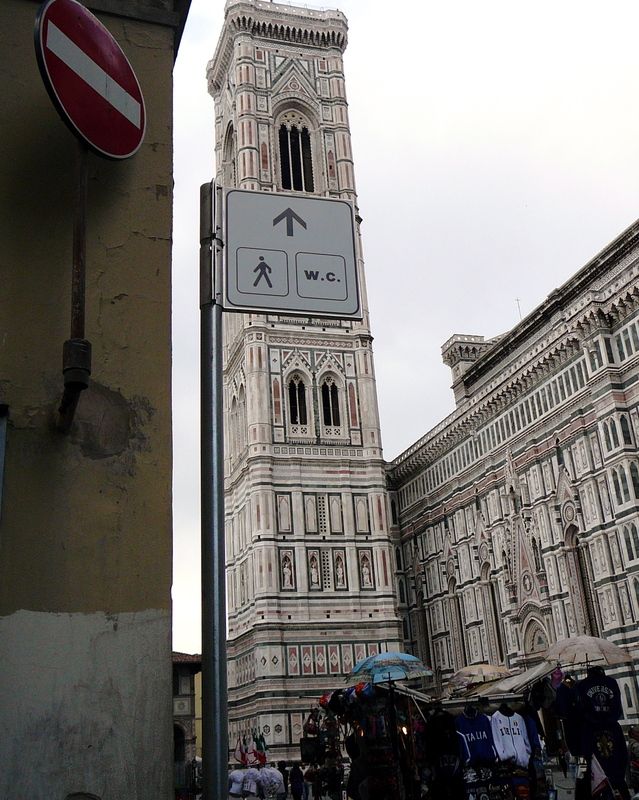 Having followed the sign in the direction of the bell tower, the path opens to the piazza between the Duomo and the Baptistry. There is no toilet there. And no sign. The eagle-eyed will spot small signs across the piazza – on the corner across the road. Sure enough there is a WC sign. BUT it is an old sign and does not point to the new pay toilets. 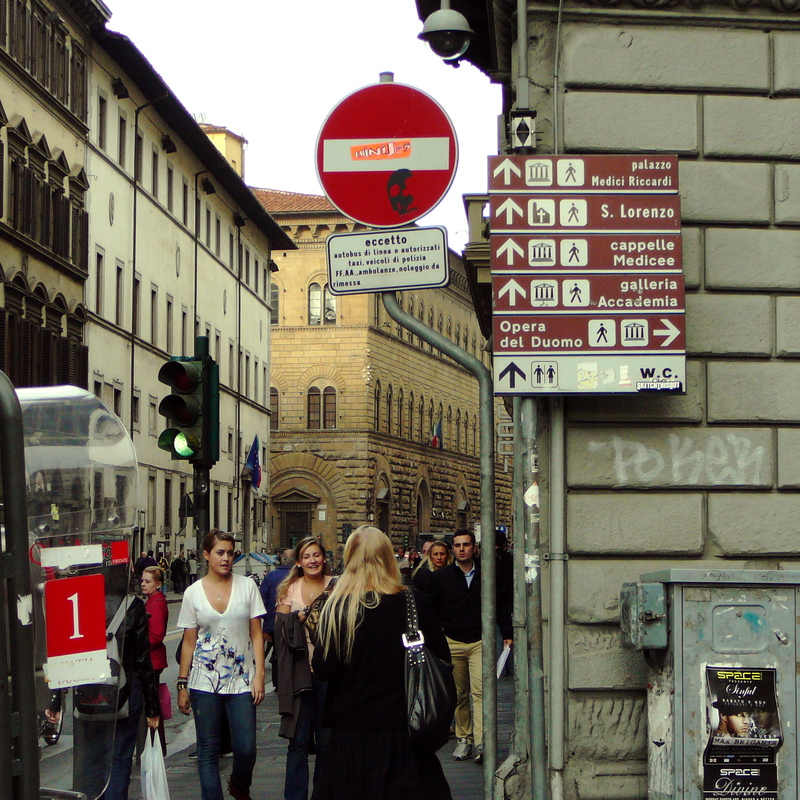 To follow that sign will lead the weary five long blocks (straight, left, right, left again and left again) to the old still-existing pay toilets on the corner of Via Taddea and Via della Stufa, which you will find eventually through no help of any additional signs. 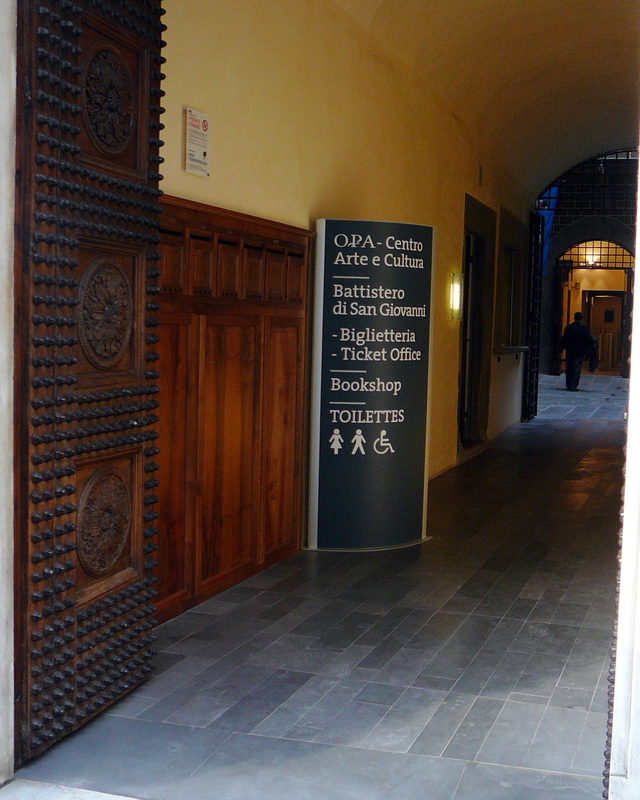 The new facility is to the left of the old sign, through an unmarked doorway with a terracotta baby St. John (copy of statue by Michelozzo) above it, down a hallway where there (finally) sits a large sign to announce your success at finding the toilettes. Now you need change (80 cents) to buy a token to open the turnstile to enter the unisex hand-washing area. The building at Piazza San Giovanni, 7, is across the street from the entrance door to the Baptistry. 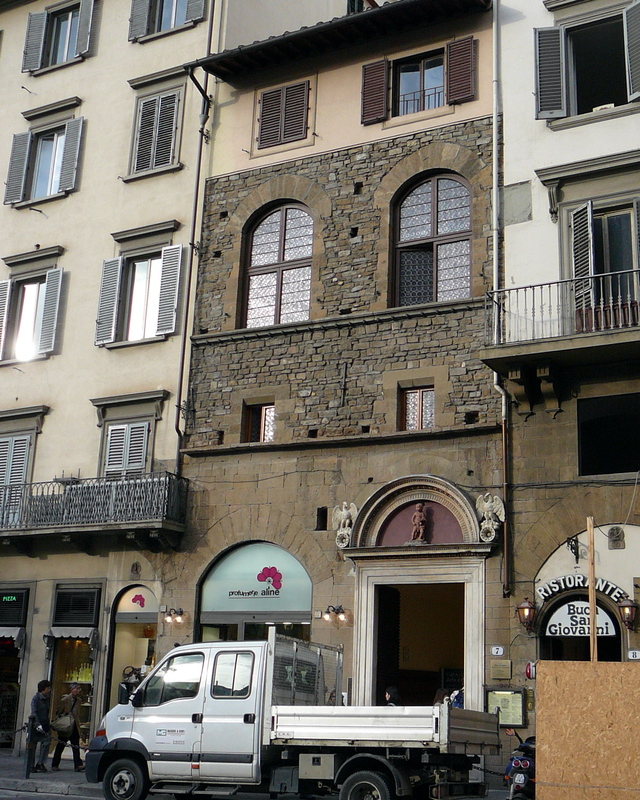 It used to be the rectory of the Baptistry and may, at some time in the distant future, become a tourist information office and meeting space. But now, it is just the place where a large number of new pay toilets are located. Yes, you may use the photo.